We have compiled various inspiring and heartwarming stories from the beneficiaries of Will’s Hope in Mesa, AZ. Feel free to browse through the stories on this page to learn more about what we do. If you have a story to share, contact our office today. That's when Will’s Hope Stepped in to help with arrangements and to help cover the cost of Alana's memorial service. As we spent some time together and we got to know each other Joseph allowed me to be there for him and he asked me some tough questions. Like, If God is so good, why did He allow this to happen to Alana? And, why didn’t He let me, as her Dad, protect her? These are the types of questions our families are asking in the midst of their grief and pain. Thankfully, he allowed me to simply be there with him and to do my best to comfort them. They also asked me to officiate Alana’s memorial service where we cried together; honored and celebrated Alana’s life and said “Goodbye for now. We’ll miss you and we love you… See you again one day!” The service was absolutely beautiful and, of course, heart wrenching! After the service the family communicated to me that they finally were feeling peace for the first time since her birth. Joseph said, “I understand now!” and began asking me questions like: "How do you know when you hear God’s voice? and what does heaven look like?” This family has a long way to go as they "grieve well” and continue to search for answers about Alana’s medical fragility and, ultimately, her much too short life. Here at Will's Hope, we are glad to have been able to walk with this family during such an important time. Thanks to all of our donors and volunteers for ensuring our readiness to stand with these precious families. This Arizona family finds joy and gratefulness in the midst of immense trials. "We want Miles as long as possible, but God has taught us through this that everything can't be fixed and everything is not up to us"
When Allison and Bryce Lefebvre found out they were pregnant with their second child, they couldn't have been more excited, loving the opportunity of more kids. Allison had experienced a remarkably normal pregnancy with Weston the first time around. With this news of a second son added to the family, they could have never imagined the question their Dr. asked... "Are you sure you want to continue with this pregnancy?" A routine genetic blood test confirmed the shockingly devastating news of a life threatening birth defect , Spina Bifida. Spina Bifida is a neurological birth defect that affects every part of the body, when in utero, a baby's spinal cord fails to develop properly. It can range from mild to severe. Testing showed, Miles' birth defect was grossly severe. Facing this life changing news, the Lefebvre's knew with all their heart, they were going to have this new baby and choose to find joy every step of the way. Miles Gabriel Lefebvre was born Jan 28th, 2015. Immediately, they knew their worst fears of where he fell in the spectrum of severity was not good. The fight for his life had begun immediately. Miles was critical and every minute was fragile. From the first day of his precious life, Miles has endured life threatening episodes involving CPR, intubation and numerous surgeries. Alison and Bryce quickly learned that Miles was not stable, and never would be. The reality was and is, Miles may not survive this. Because of the severity of his Spina Bifida, Miles requires 24/7 acute one on one medical/nursing care. He is Trached and Vent dependent, and has recently been put on Hospice care. His future is fragile and the requirements of his medical complexities are emotionally and financially taxing as their private insurance and state aid does not provide all the resources this family needs to care for him. This summer, Allison and Bryce found out they are pregnant with their 3rd son, Caleb. Happiness immediately turned to fear and unimaginable pain when once again genetic testing showed a Spina Bifida diagnosis. (A shock to both the Dr.s and the Lefebvre's as it is so incredibly rare to have one child with S.B, let alone two). 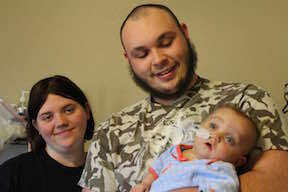 Allison and Bryce chose to again fight for the life of their newest son Caleb. With this second round of being pregnant with a Spina Bifida baby, they inquired and eventually were accepted for fetal surgery on their unborn son. A very complex, dangerous surgery on both mom and child, the Lefebvre's are willing to do anything for the chance of bettering the quality of life for their new son, Caleb. Allison and Bryce (along with the nurses who have become like family), lean on their faith in God and the help of the community, family and friends to stay strong. Having two sons' with critical medical complexities, there is always a need for more help. The struggles to qualify for more nursing, medical and child care is of the families' top priority as they embark on this journey. Through Wills Hope Charity, you can be instrumental in helping this family fight for the life of their precious children. Along with the blessing of ongoing emotional support and chaplain services from WHC in dealing with the struggles that incurs with what is ahead, Wills Hope has been instrumental in negotiating and receiving the much needed additional nursing hours for Miles. Providing the resources of more nursing care allows Allison to pursue all avenues that this surgery requires. Fueled by donations from people like you, Wills Hope will be able to provide more needed resources in the continued care for the Lefebvre's. With every day, new miracles are granted, and new adventures of hope, change, and unending love continues.... Stay tuned for the next chapter in the lives of this extraordinary family! As each need for families with medically fragile children arise, WHC desires to provide the much needed emotional, financial, and spiritual support these families need. Every families with a medically fragile Child requiring 24 hour medical care needs a support system. Your donations help us to empower, encourage, and restore HOPE for these families with life limiting ailments... THANK YOU! Abby Olsen and her husband, Eddie, were thrilled to learn they were having another baby, a welcome addition to their growing family. How lucky this new baby would be to have 3 older brothers to love on him!! The first few months of Abby's pregnancy went as planned, until a routine blood test and subsequent ultrasound changed everything. Excitement turned to sadness as they learned their baby boy had Down's Syndrome. With 3 small children already, Abby feared she wouldn't have the ability or resources needed to care for a special needs child. But no amount of fear or sadness was going to stop Abby and Eddie from loving and welcoming this baby into the world! On July 9, 2011, William Christian Olsen was born. Along with Down's Syndrome, Will was diagnosed with multiple congenital heart conditions and lung disease, leaving him extremely fragile. For the first year of baby Wills' life, Abby was overwhelmed with learning how to care for her medically fragile little boy. Will had already endured multiple heart surgeries, a placement on a ventilator and tracheotomy tube. 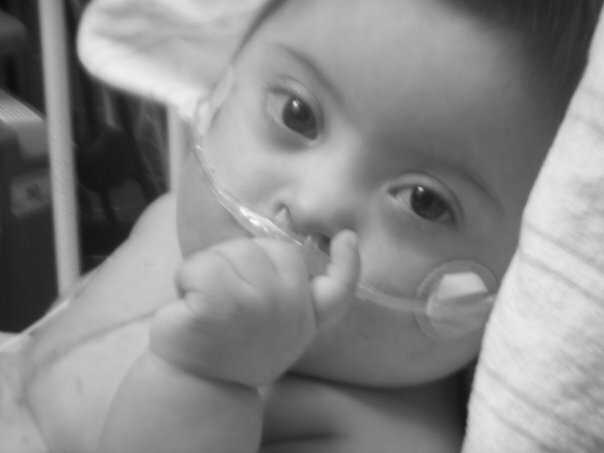 Through it all, Abby learned and researched all she could on caring for a baby with such complex medical needs. The emotional demands of caring for Will had placed an incredible amount of stress on Abby and her family, but they never gave up hope!! Will become an inspiration to not only his family, but to so many who had the privilege of knowing and caring for him. Just after his 2nd birthday (one day after Easter), William Christian Olsen passed away. Abby and Wills' journey has inspired the launch of "Wills Hope Charity." As each need for families with a medically fragile child arise, Wills Hope provides services that are needed for each families' circumstance. When parents, Kyle and Sarah, first learned they were having a baby girl, they never thought that reaching her first birthday would be such a monumental milestone!! 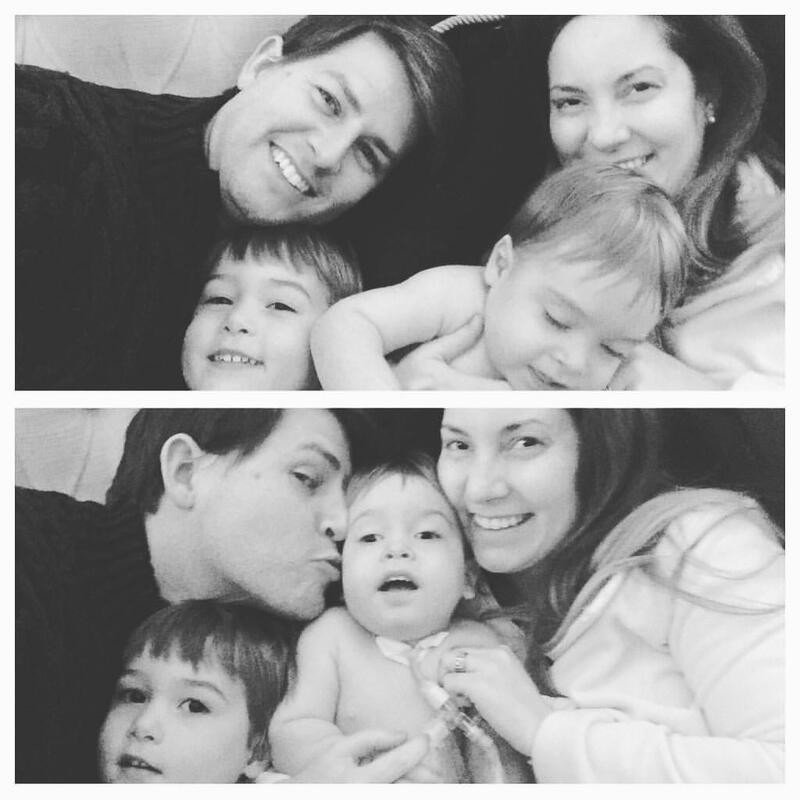 Like most of us, they never expected anything other than a perfectly healthy baby. But when she was born at just 25 weeks and weighed in at a tiny 1 pound, 12 ounces, Baby Jamie was immediately flown from the small hospital where she was born in Kingman, AZ to a level 3 NICU 3 hours from home in Phoenix, AZ. 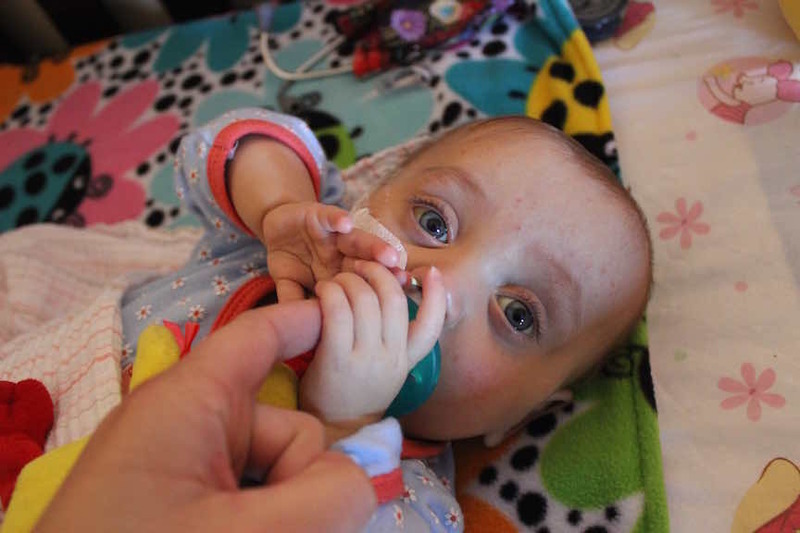 Being a medically fragile preemie, Jamie's underdeveloped intestines and lungs required her to have a feeding tube, IV, a colostomy bag and 24/7 nursing care just to stay alive. By the time Jamie was 8 months old, she had been cared for in 2 different children's hospitals and endured 2 complicated surgeries. But shortly after her surgeries, Jamie's parents were told she no longer met the insurance requirements for her to stay in the hospital, yet her medical needs made it impossible for Jamie to go home. Remarkably, this is where there are major holes in our medical care system and parents are left to figure out how to care for a child with complex medical needs without the support and resources of a hospital. This is when Jamie’s parents learned of Bogden House and Will’s Hope Charity. They were thrilled to find that in their moment of fear and desperation, there was help. In December, at 9 months old, Jamie was moved to the Bogden House, a medical group home specializing in caring for children like Jamie with complex medical conditions. They learned that Bogden House provides exceptional continuity of care, minimizing hospital readmissions and providing Jamie with the highest possible quality of life in a family home environment. There she has round the clock care, medicine, and the staffing needed to help Jamie survive daily. However, her parents work and live 3 hours away and lack the resources to uproot their lives and move to the Phoenix area. Because of the generous donations from heroes like you, Will’s Hope has had the privilege of serving baby Jamie’s family during her stay at Bogden House. Will’s Hope provides help with transportation, meals and housing which allows her family to visit and be together for important occasions such as doctor visits. Without this support, baby Jamie’s parents may not have been able to visit their daughter and play an active role in her care over the last few months. This month, Jamie is celebrating her first birthday, a miracle moment for her doctors and family. In the past year she has overcome so many obstacles and surpassed the expectations of her family and caregivers. She now weighs 15 pounds and is 26 inches long. Her doctors say she may no longer need a liver transplant and continues to make improvements by leaps and bounds. Although Jamie has a long road ahead of her, as she approaches her miraculous one-year milestone, she continues to inspire and bring joy to everyone around her!! And with the help of Wills Hope Charity, baby Jamie's family will travel to Phoenix and spend her birthday with her!! This will be a special day for all that love this bright blue eyed little girl!! Nothing could prepare Celia Gutierrez for what was to come. This young mom to be was only 25 weeks along when she was rushed to the hospital. Within days, much too soon, Celia was in labor. 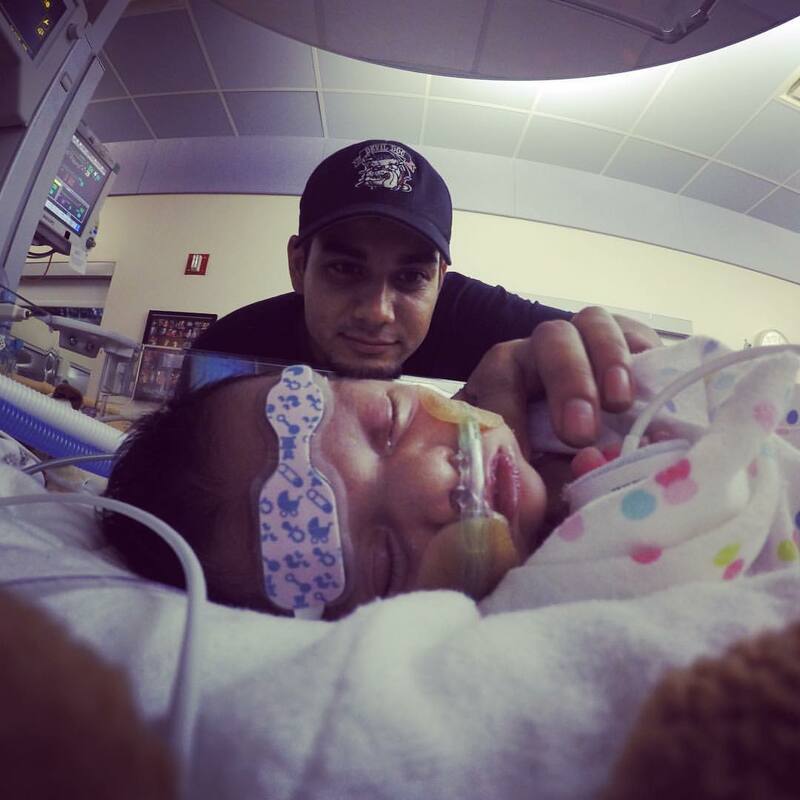 Azareena was born March 30, 2015, only weighing just over 1 pound. 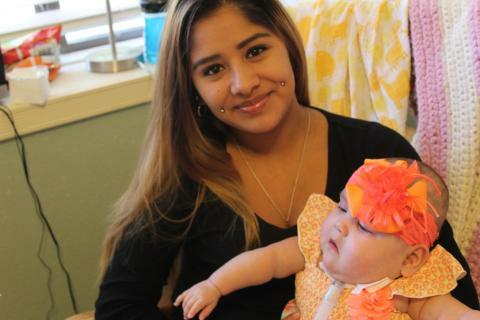 Critically ill, with severely underdeveloped lungs, life changed overnight for this 17 year old single mom. For the next few months, Celia's feelings of immense fear for her medically fragile baby was coupled with the sadness of only being able to visit her in NICU every other day. Celia struggled financially to be able to be closer to her gravely ill new daughter, having to wait for rides from supportive family. It was a roller coaster of emotions having to leave her every day. By 9 months of age, Azareena had become technology dependent just to stay alive. Tubes and machines were hooked to her tiny baby, a vent and trachea tube to help her breathe and a g-tube for feeding. Even feeding Azareena was not possible as Drs feared her fragile muscles would not be able to swallow properly. Bringing Azareena home was a dream Celia was realizing was going to be difficult. Celia needed help, but most of all, she needed hope!! At 9 months old, Azareena was still too weak and fragile to go home. Dr's referred Celia and Azareena to Bogden House, a local group home for children who are medically fragile. In conjunction with the 24/7 medical care Bogden House provided and with help from Wills Hope Charity, Celia was able to get the final steps of education needed to care for Azareena at home. Preparing for her delicate daughter to come home permanently became Celia's ultimate goal. Will’s Hope helped foster that transition! Fueled by donations from people like you, Wills Hope was able to help Celia travel from home to Bogden House, providing gas cards to her financially struggling family. This was instrumental in allowing Celia to get the education needed in teaching her to care for Azareena at home, as well as the much needed bonding Celia longed for. Today, Azareena is home, being able to spend her birthday surrounded by mom and family. With the help Celia received from Bogden House and Wills Hope, her dream of caring for her daughter full time is now a reality! Celia now has the help, support and education needed to care for daughter with so many medical complexities. As each need for families with medically fragile children arise, Wills Hope desire is to provide the much needed emotional, financial, and spiritual these families need. Every one of these families need a support system when your child requires 24 hour medical care. Your donations help us to empower, encourage, and restore HOPE for these families with life limiting ailments. If there is a need, Wills Hope is there to help!!! Help save a life and encourage hope in a needy family. Donate any amount to Will’s Hope and be assured that your money will reach medically fragile children in and around Mesa, AZ. Any support is greatly appreciated. In-kind donations are also welcome. Contact us today for more details on how you can help. We look forward to hearing from you.